Following Chelsea’s controversial 2-0 win over their bitter rivals Arsenal yesterday, the main focus was drawn on none other than Chelsea striker Diego Costa at the final whistle. The Brazillian-born-Spanish striker got in the thick of the action in the dying stages of the first half with Koscielny but got lucky to remain on the pitch despite his antics that led to Gabriel Paulista’s sending off before the half time break. Jose Mourinho and his men got one over naive Arsenal team who caused an upset on the Blues earlier this season in the Community Shield match – courtesy of Alex Oxlade Chamberlain’s goal which was enough to separate the two sides. Questions about Costa’s behaviour was thrown at manager Mourinho on the post-match interview but the Portuguese purposely chose to ignore the questions and defended his striker’s antics by declaring him as the ‘man of the match’ for his performance. 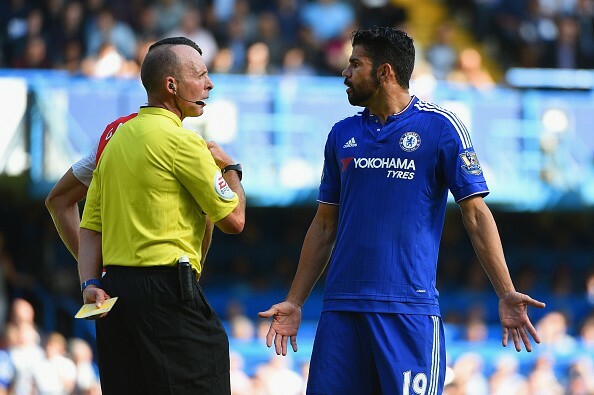 Most of the fans on Twitter were certainly not pleased by the manner in which the Chelsea striker escaped from punishment by Mike Dean, who failed to spot Costa’s slap on Koscielny’s face that left teammate Gabriel furious. The naive Brazillian defender reacted to his oppenent’s unaccepted behaviour but eventually saw red and Costa yet again executed his master plan on provoking his opponents on the pitch. Alot of criticisms and spolitlight has been drawn on Costa for his antics and here’s a compilation of how the pundits reacted after the game. Can't imagine what Costa would be like with a few drinks inside him. I would love to have played against Diego Costa! "Diego Costa must be charged and banned by the Football Association for slapping Laurent Koscielny in the incident which preceded Costa's prolonged clash with Gabriel Paulista which resulted in the Arsenal player being sent off.” former FA official Graham Poll wrote on Daily Mail. "The dismissal was a silly one for Arsenal’s Brazilian who was wound up by Chelsea’s centre forward and Mike Dean had to show the red card when he saw Gabriel's petulant kick at Costa. "Dean will be disappointed that he missed the main incident between Costa and Koscielny - given the disciplinary action he took it is safe to assume that it occurred away from his view." Will Sarri succeed without a prolific striker?